Mix chocolate with other things. “You consume less chocolate when you eat in conjunction with something else,” says Shapiro. “At any supermarket, you can find chocolate-covered strawberries,” or you can make chocolate-dipped bananas or dried apricots. Trader Joe’s sells chocolate-dipped almonds, which Shapiro says are a good option if nuts aren’t an issue for your children. She also likes making chocolate bark by melting 70% dark Valrhona chocolate discs, spreading it on parchment paper, and topping it with Goji berries, puffed quinoa, and sea salt. “It’s like a healthy Nestle Crunch.” Here’s a recipe to try from Food52. There’s nothing wrong with carrot sticks. “Just because it’s an Easter basket doesn’t mean you should stay away from something truly healthy,” says Shapiro. 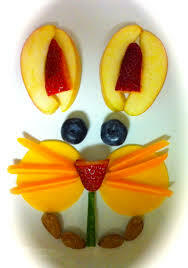 “Plus carrots relate to what the Easter bunny eats.” So put some carrot and celery sticks in there! This entry was posted on April 3, 2015 at 12:31 am and is filed under Nutrition. You can follow any responses to this entry through the RSS 2.0 feed. You can leave a response, or trackback from your own site.